In The Explanation Age, we define learning as “the gaining of knowing, satisfied with some degree of reason.” It is the second part of this definition that has been neglected in prior definitions, and more importantly, in methodologies of learning, for individuals, organizations, and AI. As “mental misers,” we quench curiosity by accepting the reason with the least level of effort (cognitive demand) required. So the lower degrees are more efficient than higher degrees. For example, “because I wanted to” (first degree) is a reason that takes less effort than “because the hypothesis was confirmed” (seventh degree). While many people have made contributions in advancing our understanding for each of the 8 Degrees of Reason, there are some people that stand out for their significant influence. In their approach to explaining why people respond as they do, it is hard to find a more extreme example of different approaches than by looking at B. F. Skinner and Socrates. For the 1st degree of reason, B. F. Skinner is known for his contributions to behavioral psychology and those answers to “why” that come from a reactive reason. Skinner’s insights were around the common ground between training pigeons and training people. But people have more reasons than pigeons. At the other end of the spectrum, the 8th degree of reason, Socrates is known for his method of questioning in what is called the Socratic Method. Why did the chicken cross the road? The answer to this old joke is “to get to the other side.” The problem is that it is not really funny when these types of answers appear when we are trying to address collaboration and conflict resolution. 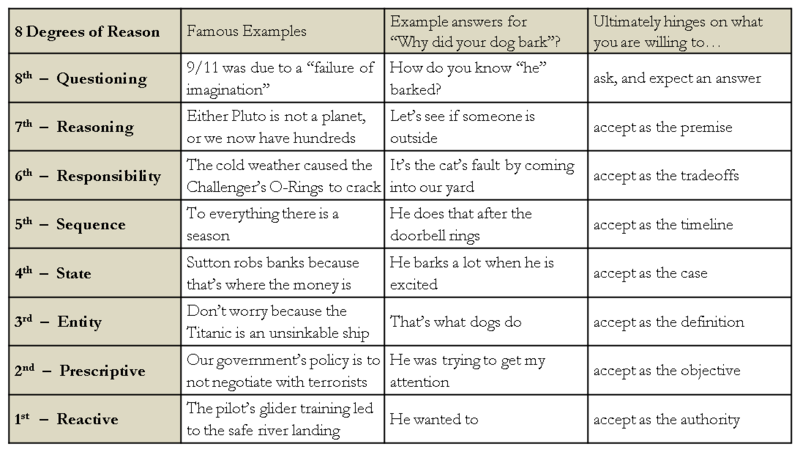 Instead of asking the open-ended question why, if we engage in an exercise of asking what, we can be more precise in our communications: what tradeoffs, what principle, what definition, what motive, etc. If we ask for tradeoffs, instead of just asking why, we may find that there are none, and so the reason is just from want (first degree), not judgment (sixth degree). In applying the eight reasons during collaboration and conflict resolution, we will ultimately reach a point where we can find what the explanation is based on. For example, explanations that come from the first degree of reason will ultimately tell us what or whom you are willing to accept as the authority. And explanations that come from the eighth degree of reason will ultimately tell us what you are willing to ask, while expecting an answer. Questioning is not just an exercise in brainstorming or creativity. The key is that we have to expect an answer. When Albert Einstein asked himself the question of what he would see if he could ride on a beam of light, he expected an answer. And it was this expectation of an answer that led to his theory of relativity. If we ask a parent, CEO, or elected official how debt can continually increase without eventual bankruptcy, yet let him or her talk without answering the question, then questioning did not occur. For Questioning to be given as the reason within an explanation, there needs to be more than just asking, there needs to be an answer. We can recognize a character of the alphabet, but we should also be able to recognize where we are within an explanation. And by knowing where we are and where we want to go, the system will appear intelligent. The reason that we have not seen major advancements in generalized AI is because we have not seen major advancements in a philosophy of mind for the technology to rest upon."